The Nilfisk Buddy II Inox is a small, lightweight, yet powerful wet and dry vacuum cleaner... for your home, car, workshop and hobbies. This second generation of Nilfisk Buddy comes with a 18 liters polypropylene container making the machine very robust. 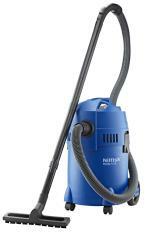 The Nilfisk Buddy II is a small, lightweight wet and dry vacuum cleaner and yet powerful. This 18 liter version will be the perfect choice when you need to pick up wet or dry debris in your home, your car, the workshop and hobbies. It is easy to move around and compact in storage. The light weight makes it handy to work with. 18 liter version with robust Polypropylene container.